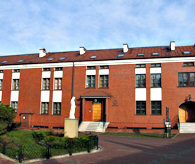 The “Misericordia” Publishing House of the Congregation of the Sisters of Our Lady of Mercy has been operating since 1 January 2003. It was established by M. Gracjana Szewc, Superior General, to proclaim the message of mercy by preparing and promoting publications related to the life and mission of St. Sister Faustina. In pursuing this task, the “Misericordia” Publishing House publishes and promotes books, pamphlets, brochures, reproductions of paintings, leaflets, CDs and DVDs in many languages. They serve not only to promote the message of mercy, but also for the formation of the Apostles of Divine Mercy.